This week we revisit Interstitial Author/Editor Mike Allen, well known in our community for creating and editing Clockwork Phoenix and Mythic Delirum to learn about his current projects and the success of his recent crowdfunding campaigns. IAF: Can you re-introduce yourself and give us a little background on who you are and what you do? Sure! I’m a journalist, novelist, poet, occasional visual artist, and most relevant to the Interstitial Arts Foundation, an editor and publisher. I’ve been curating my own idiosyncratic assortments of weird fiction and poetry for a couple decades now. 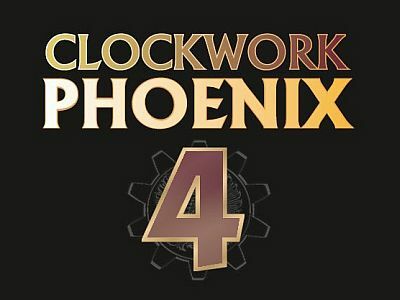 My best known project is without a doubt the Clockwork Phoenix anthology series, which blends genres like nobody’s business. IAF: Please fill us in on the outcome of the project you were working on during your last interview here, Clockwork Phoenix, and your crowdfunding project? 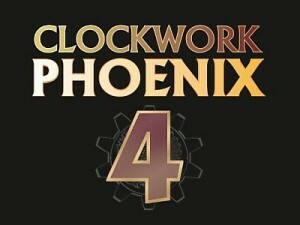 When we last left off, I was in the middle of promoting the Clockwork Phoenix 4 Kickstarter. The first three volumes of the Clockwork Phoenix series were published by Norilana Books, and I remain grateful for publisher Vera Nazarian’s generosity. Norilana, unfortunately, sank under well-publicized financial troubles, and could not continue the series. I shopped it around to other publishers, but despite all the accolades Clockwork Phoenix had accumulated, I found no takers. I kept hearing from people hoping for another book, so at last braved the waters of Kickstarter. And, as you must be able to guess, it was a smashing success. I asked for $5,000 to fund the fourth book and raised more than $10,000. With all the rewards my wife Anita and I had pledged to make for the sake of raising funds, it turned into a massive project, the biggest thing we’ve ever tackled, but we delivered everything on time, including the book itself, stories from which have been picked for at least three “best of the year” volumes , as well as nominated for the Nebula, Theodore Sturgeon and Shirley Jackson awards. To crib from LL Cool J, I think we can call it a comeback. The Clockwork Phoenix 4 Kickstarter also gave me the seed money to reboot my other long-running editor-hat project, Mythic Delirium. I realized–with some trepidation, I’ll admit–that getting the reboot right was going to require a second Kickstarter, and the do-or-die timing dictated that we launch that Kickstarter right as the first one was finishing up. That was a pretty exhausting ordeal, but the Mythic Delirium Kickstarter also went astonishingly well, raising $3,500 when we asked for $2,500, allowing me to switch the format from a print poetry journal to a digital journal of poetry and fiction, and shoring us up so we could keep putting out new issues through mid-2016. I’m putting the finishing touches on our fifth digital issue at this very moment, in fact. IAF: IAF just completed a very successful crowdfunding campaign on Indiegogo—we were delighted with the level and breadth of support. Do you have any thoughts on crowdfunding in general for artists, editors, or organizations? Is it positive for the field in general? It’s certainly a positive for me! But generally, yes, for certain. In terms of the genre small press, it completely flips the equation–once upon a time, if I wanted to publish a book as strange and niche as Clockwork Phoenix, I would have had to live with the idea that I was going to lose thousands of dollars of my own money and hope that, despite limited resources, I could put on enough hustle to recoup at least a little of what I spent. Crowdfunding puts the hustle right up front, cast out to a wide audience, and if you make your goal, then you start out with everything paid off and your book pre-sold–so long as your budget’s solid and you’re solidly committed to giving your backers everything you promised them. I have to assume that you can extrapolate this throughout the full range of the arts, even the interstitial ones–especially the interstitial ones. Doing something that doesn’t fit in any commercial category? Put up a page that shows and tells what you want to do, promote it directly to the audience you hope will find it interesting, and let them decide if they want to help you make it. Back to publishing again: people fret about relying on Kickstarter to support a long-term project like a magazine, and that’s understandable: if you don’t make your goal, you’re done. (Indiegogo, I imagine, mitigates this effect somewhat, since you get some of the money you raise regardless.) But you know what? These days, the traditional subscription model isn’t any more reliable — unless you enjoy death by slow attrition. People respond to crowdfunding campaigns; maybe it’s the time limit that makes all the difference. Mythic Delirium at least is scaled to a schedule and budget that lets a single fund raiser cover me for several years, and gives me time to work on other projects. IAF: Mythic Delirium is very open to interstitial artists. Is it challenging running a venue that doesn’t stick to genre in this day and age? Oh, yes. I don’t feel like many people have grasped yet just what the new Mythic Delirium is, exactly. I imagine it as a regular home for things off the beaten track even by the standards of Clockwork Phoenix. We’re not quite there yet, but the night is young. Understand, Mythic Delirium has always been out there in an odd corner. Remember, it started out as a science fiction poetry journal — how interstitial is that? For a while, when we were under the DNA Publications umbrella, I’m pretty sure Mythic Delirium was the only journal of its type in sf history to have the backing of a major publisher. We were a sister magazine to Weird Tales, not something I ever saw coming when it started. But now we’ve gone digital and introduced fiction, but we still heavily emphasize poetry; essentially the new version of Mythic Delirium resembles a typical literary magazine in the proportions of its content, which seems to confuse people that much more. One recent development that caused a lot of eye-rolling here at the house: a prominent fantasy fiction reviewer decided to stop covering the stories that appear in Mythic Delirium, because to that person they seemed too much like poems. I wish I was making that up. We’re reopening to submissions Aug. 1, and I’m hoping to see more adventurous work, both fiction and poetry, then I did the last time around. Be brave, fellow artists! IAF: You are a successful writer (and Nebula nominee!) as well as an editor. Any recent publications you’d like to tell us about? What’s up next? This has been a giddy time for me. Last year my first novel, The Black Fire Concerto, came out from Haunted Stars Publications (an imprint of Black Gate) at the same time that I released Clockwork Phoenix 4. I think of it as my own weird take on the sword and sorcery tradition, but everyone else seems to want to call it a horror novel, heh. The Mythic Delirium Kickstarter funded two new books from me–see how that keeps happening? The first is a new collection of my poems called Hungry Constellations, with selections by Dominik Parisien, cover art from paper cutout artist Paula Arwen Friedlander and an introduction from Amal El-Mohtar, who ought to be very familiar to IAF readers. I’m really impressed with the arrangement Dominik made from my bizarre flowers-in-verse, and I’ll be sharing the results with backers before the month is out. The second is a paperback that collects the first four issues of the digital zine, which Anita and I are just going to call Mythic Delirium. Anita has done a bit of additional editorial arrangement, so that it’s not just the four issues rehashed, and we have beautiful cover art from Hugo winner Galen Dara. I expect to have that available by late October-early November. IAF: This is something I’m sure a lot of people ask you–you do so much! Journalist, editor, author—where do you find the time for it all? I’m sure it helps that I don’t have children — the people who can make time to do this sort of thing as full-time parents are the real heroes. Still, it is a bit of a balancing act. It helps that I’m obsessive in my pursuits. In more practical terms, I’ve gotten better and better at making sure I work on something each day, and on keeping a schedule that has me jumping back and forth from writer to editor in a way that simulates variety. IAF: The IAF Magic Wish Question: One Wish: If you could change one thing about your current situation, what would it be? Everything that I think up has one basic tenet in common, so I’ll run with that: I wish that consumers of books, movies, art, music, theater, whatever discipline you can imagine, would be more curious, and more willing to explore the unfamiliar. Too many, it seems, seek out only the artistic equivalent of comfort food, and blithely miss out on the spice-rich masterpieces right across the street. This entry was posted on Sunday, August 10th, 2014 at 2:14 pm by InterstitialArts and is filed under Interstitial Editors, interviews. You can follow any responses to this entry through the RSS 2.0 feed. You can leave a response, or trackback from your own site.